We returned to our home base in Takatsuki and will commute the next three days to Happy House, an animal rescue in Noseguchi. Over 130 dogs, many of whom have been there for years. 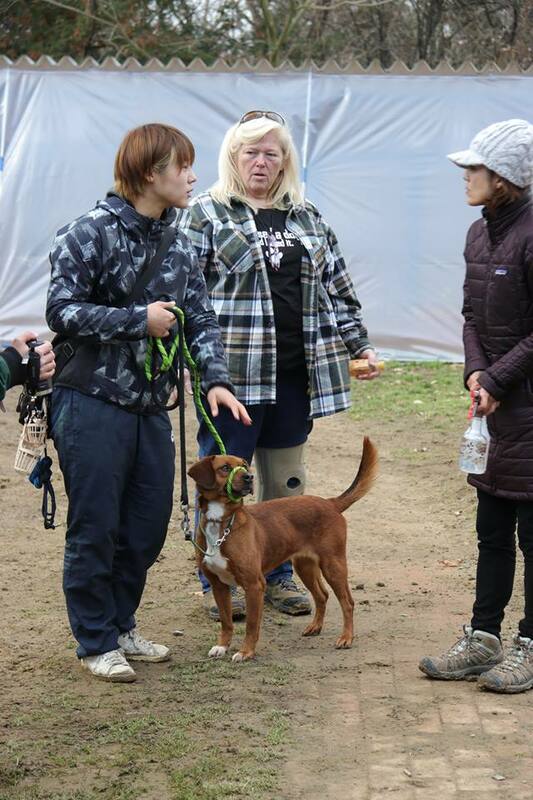 Again, adoption of rescue animals is not prevalent in Japan. So not only are we teaching new philosophies of dog interactions and socialization but we have the cultural differences as well. We’re so glad to be here to inspire change, educate and save lives. 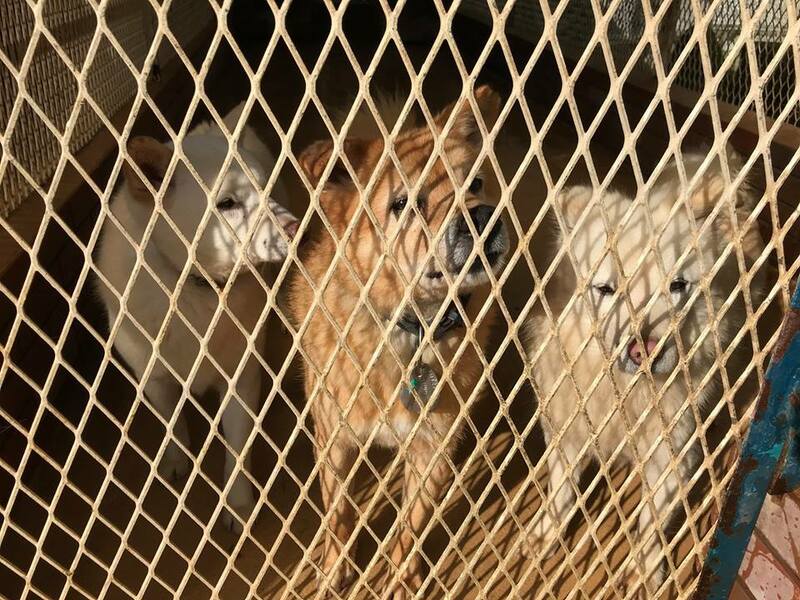 These three are fortunate enough to be trusted to get along... the kennels are fairly large and house multiple dogs, however few of them are trusted to get along with one another. For safety reasons, most are chained within the kennels. This old guy lived in a special area for older dogs with mobility issues or cognitive problems. They received extra care and attention to help them remain comfortable for the remainder of their lives. The manager of Happy House adopted this spirited two legged boy. Creating a pack! We started with the smaller dogs as they were less intimidating than a large breed pack. Oddly enough, the little Maltese with the jacket standing near Colleen's feet, was the most feared dog in this group. Snuggling with the 'mean beast' that tormented the staff and volunteers. We didn't seem to have any issue with him, and were able to help the staff learn how to approach a fearful dog, transforming him into a snuggle bug. A long haired Doxie pulling at the heartstrings of our Director. 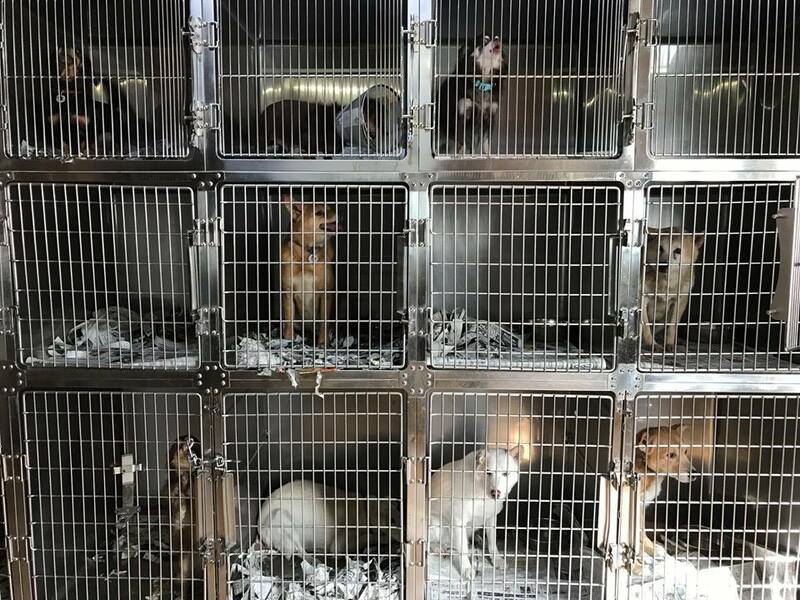 SO many of these dogs would be considered "adoptable" by our standards in the U.S., however with adoptions seen as undesirable in Japan, most here will remain in the shelter for the remainder of their lives. Medical care is provided to this little girl who has a case of demodex. Although it is difficult to see images like these, it MUST be said that this is considered "normal" for dogs to be housed in this fashion... with that said, the staff and volunteers at this facility were dedicated to making sure these dogs living areas were well cleaned, food and water were in ample supply, and safety was at the forefront of their practices. It must also be said that, for THIS facility, they believe they can do even more... which is why they hosted us and have consumed ALL we could teach within the few days we worked with them. CHANGE IS COMING and Happy House will lead the way! Yep... it was bound to happen. Working with some very terrified dogs here. Our Director was requested to work with some of the most difficult dogs in the facility, one of which had been here for 7 years on a 3' chain, with NO human contact. He was considered 'aggressive' to any who approached. After only 10 minutes, Colleen had him leashed and out in a yard where he was attentive, affectionate, and playful. He quickly learned "Sit" and took treats gently from her hand. It was amazing the transformation. A happy, playful, loving dog that discovered freedom from a 3' chain. 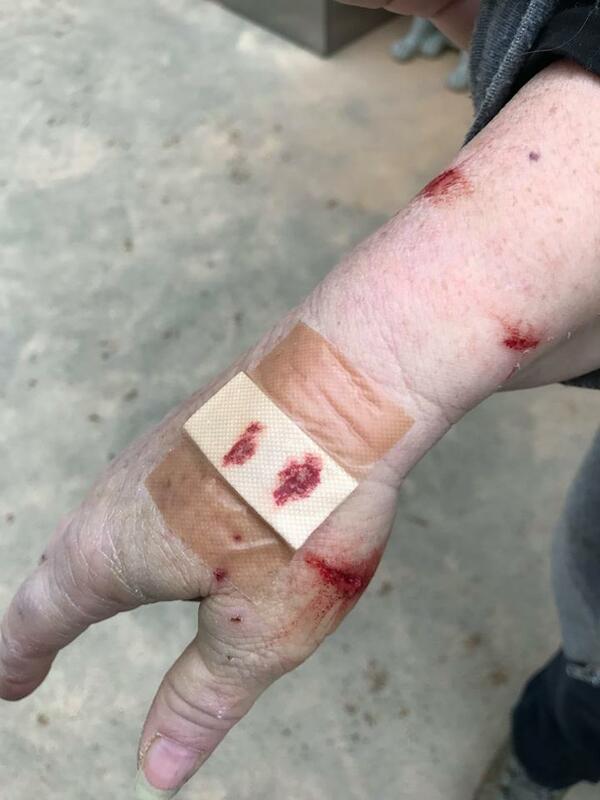 When returned to his kennel and the volunteer attempted to connect him back to the chain, the dog became violent and aggressive. Colleen stepped in quickly to prevent the volunteer from being attacked, and in the chaos, was bitten herself. This was NOT an aggressive attack!!! This was absolute refusal to return to the chained life he has known for 7 years. Colleen will return to work with him again before leaving. 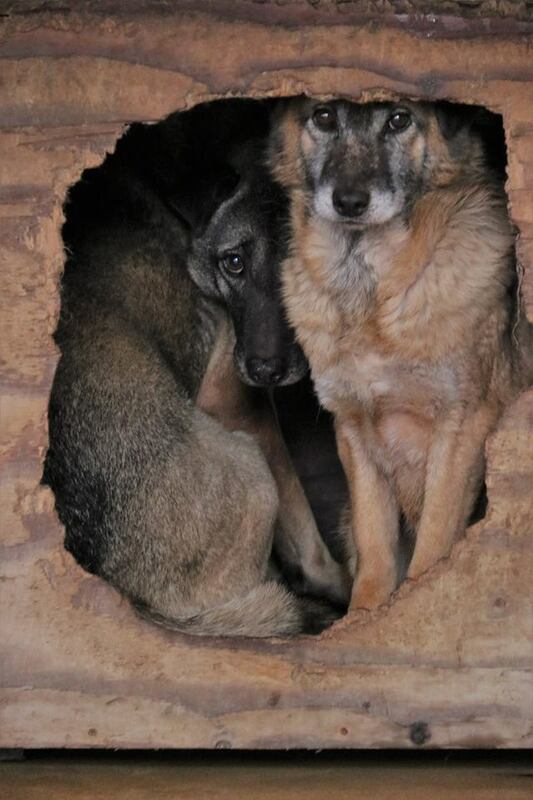 A room where the Older dogs are given freedom to roam. The eyes say everything. Our incredible volunteer Tim Simkins spent several hours entering the kennels of the shut down dogs and taught volunteers and staff how to simply "relax" with each of these shut down dogs. Bravo Tim! Lunch at Happy House with manager Yuji (head of table), one of the trainers (next to Colleen), Yuki (across from Colleen), and Nau (who will be coming to Green Dog for an internship). An Aussie mix that has spent 7 years on a chain and unable to be touched by humans. Within 5 minutes, Colleen had a muzzle on him (safety first), and brought him out for some sunshine and affection. Shelter manager Yujhi and the remaining staff were astounded that this dog could be handled in such a short time. With the protection of a muzzle, staff was educated on how to, and encouraged to provide affection to this boy. Our incredibly patient and magical volunteer/assistant, Tim Simkins, spent much of his time working with many of the withdrawn and 'shutdown' dogs that were considered feral. Later, staff was instructed on the importance of 'patience' when dealing with a withdrawn dog. Although our culture is generally dismayed and opposed to chaining a dog, you can see here that some find peace and solitude to their lives. Working with 3 future leaders for change... we began by teaching body language and social norms for pack development. We also introduced the power of water bottles. Two days prior to our arrival, Happy House was asked to assist with a hoarding situation involving 13 dogs that were considered "feral"... here are two attempting to find their footing after being processed. One of the senior dogs in care with a special medical condition which causes his eyes to bulge. He was very content to wander around in an entry yard that allowed him access to an indoor office area. 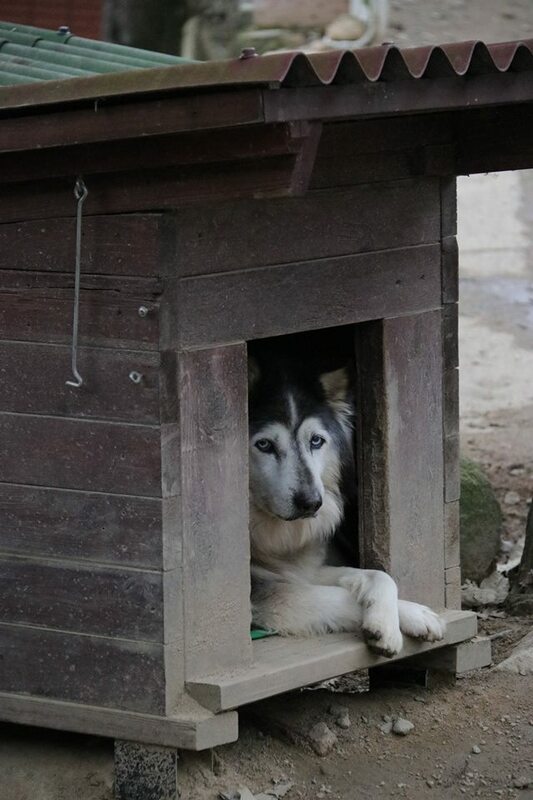 A dedicated yard and room is designed for extremely ill, or infirmed/disabled dogs, where they are loved and cared for until their natural passing. "Horn" (pronounced Hor'un) experiences freedom at the end of a leash with her handler, and since she was a bit overzealous, a makeshift gentle leader was demonstrated for ease of walking. Horn proved to be quite the character and was later introduced to a pack. Another disabled dog being cared for in the infirmary. "Gucky" (pronounced like Lucky) begins to understand that she is NOT allowed to bully newcomer Horn. She later was able to have her muzzle off without incident, but we were focused on safety to ensure that progress for this new program could be made. Becoming part of a "pack" can be exhausting work. Time for a nap. Three up and coming pack activists and ALPHA leaders, Our translator Yuki, fearless dog trainer Tim Simkins, our newest intern to come, Nau, and our Director, with love and support from available dogs at Happy House. The Happy House compound. We finished our last day there with such a feeling of gratitude for the chance to work with them towards the common goal of making life better for these dogs.